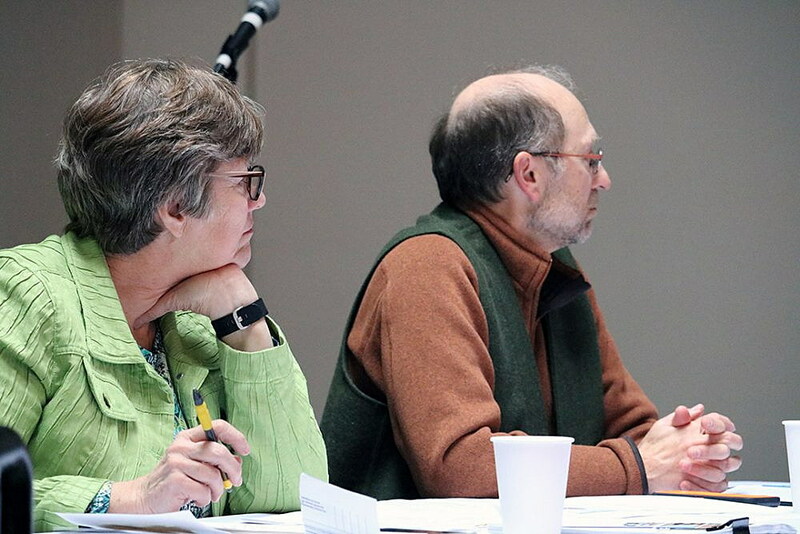 Missoula County Commissioners Jean Curtiss, left, and Dave Strohmaier, both support a local options sales tax as a means to fund local government and provide some relief to property owners, they said at a panel discussion on the topic Tuesday. (Martin Kidston/Missoula Current). A report released by Garner Economics earlier this year found that if Missoula County had a quarter-cent sales tax in 2016, it would have generated $5.6 million in revenue, helping local government fund vital services while providing relief to property owners. But as it stands, a panel of local elected officials said Tuesday, such taxes aren’t permitted in Montana, barring a few exceptions. And that has forced local governments to rely almost exclusively on property taxes when paying for essential services. It’s time that scenario changed, members of the panel agreed. 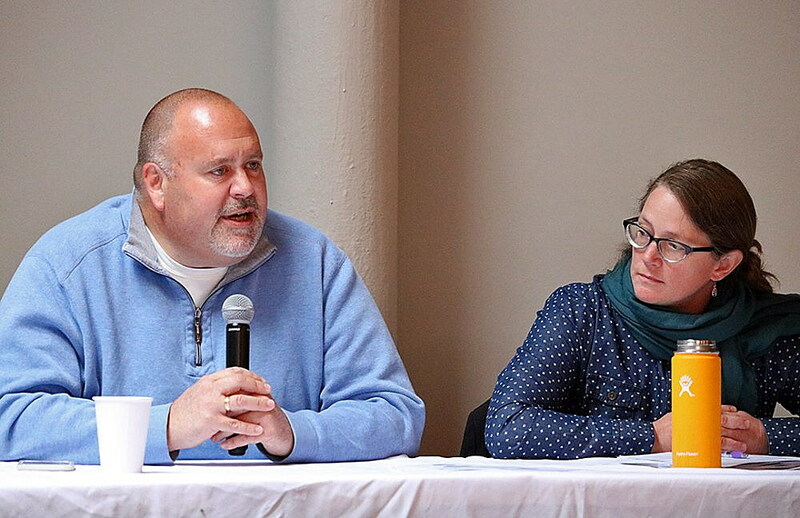 In Tuesday’s panel discussion, Curtiss, along with Commissioner Dave Strohmaier, Missoula Mayor John Engen and City Council member Heather Harp, were each asked to identify flaws in Montana’s tax system and offer ways to address them. The question was selected as a follow-up to this year’s budgeting cycle, in which most elected officials in Missoula city and county government expressed frustration over the state’s tax system, its inherent inequality, and the burden it has placed on property owners. The event was sponsored by the Missoula Current and hosted by the Missoula Downtown Partnership. Nonresident visitors spent $3.2 billion throughout Montana last year, according to a report released this week by the Institute for Tourism and Recreation Research at the University of Montana. That included more than $294 million in Missoula County alone. But with the exception of a small bed tax and gas tax, most of that spending didn’t go toward essential services, be it plowing and paving or police and fire. Rather, Strohmaier said, that remains the responsibility of property owners. For a city resident, roughly 37 percent of one’s tax bill goes to Missoula County Public Schools, while 29 percent goes to the city of Missoula and 18 percent goes to Missoula County. Roughly 30 percent of the city’s tax portion covers police and courts, while the second largest piece at 23 percent, funds the fire department. Like the other panelists present at Tuesday’s forum, Mayor John Engen believes a local option sales tax is worth considering. But that would require changes at the legislative level, a concerted effort by Montana’s cities and counties, and finally, approval by voters, he said. Under the current system, only a handful of small Montana communities, such as Whitefish, Big Sky and West Yellowstone, are permitted to carry a resort tax. But larger municipalities cannot, and a growing number of elected officials across the state have come to question the balance of that equation, especially as services increase in cost and property owners grow more vocal about rising taxes. State law allows communities with populations under 5,500 people to adopt the so-called tourism tax, which captures visitor spending on lodging, car rentals, liquor by the glass and meals, among other items. A University of Montana survey released earlier this year found that nearly 65 percent of Missoula residents would support a 3 percent tourism tax, so long as the revenue resulted in a decrease in property taxes. In each of the last few legislative sessions, municipalities have lobbied to place a local option tax on the ballot. But the Legislature has balked for a number of reasons, leaving cities to rely almost exclusively on property taxes to fund services. City Council member Heather Harp said a local option tax should be considered as a solution.